The Energy School in Switzerland started its project in June 2016, inspired by Bahay Kalipay, the House of Happiness in the Philippines, and Panditarama Vipassana Center, in Lumbini, Nepal. Our retreat center is located in a traditional Swiss chalet in front of the lake of Thun, near to Interlaken. The house is being transformed into a retreat space to run yoga, meditation and personal development programmes. The Energy School House is located between the Swiss Alps and The beautiful Thun Lake, ready to start a trekking walk and visit the forest and the mountains or crossing the street and enjoy a swim. Our team is made up of people from different parts of the world, passionate about personal growth and service towards others. Offering a complete and unforgettable experience is the essence of our journey. 2 sleeping rooms with capacity for 6 pax each = 12 persons in total + a private room for the teacher + 1 attached apartment with 2 double sleeping rooms. Lot of green and nature access. At the moment our courses offer includes different varieties of Yoga , Inner Dance, Vipasana, healing tibetan bowls & Interpersonal Mindfulness retreats. We offer our house for groups interested in spending some time surrounded by nature and a good service. Vegetarian food, accommodations, and the workshops area are at your disposal, please contact us, we are looking forward to collaborate with you. "May all beings be happy and free"
The nature that surrounds the Energy School Retreat is incredible. During the summer, the winter or the intermediate stations there are diverse outdoor activities, and amazing places that we would like to take you! 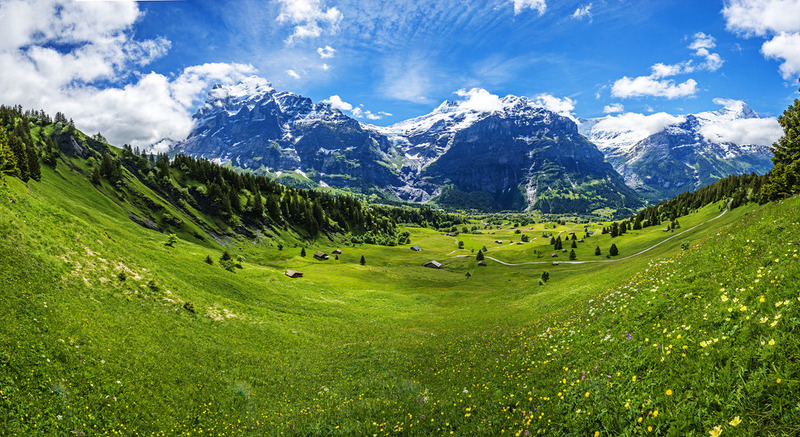 From our house begin diverse and delicious mountain roads that allow us to reach the Oeschinensee lake and the beautiful alpine village of Murren among many others places around Därligen, Interlaken area. Paragliding, Paddle boarding, rowing activities. the winter offers the possibility of doing sports in the snow as well as enjoying cozy moments in the Swiss mountain shelters.